On April 1, 1966, Opel opened the most modern proving ground in Europe. they made it possible to carry out state-of-the-art tests. will be celebrating its 50th birthday with an open day event. Opel Post brings you the Dudenhofen story in three installments. The roads to enter and exit the mountain section of the Opel proving ground in Dudenhofen are like mountain passes, with the tightest imaginable hairpin bends. 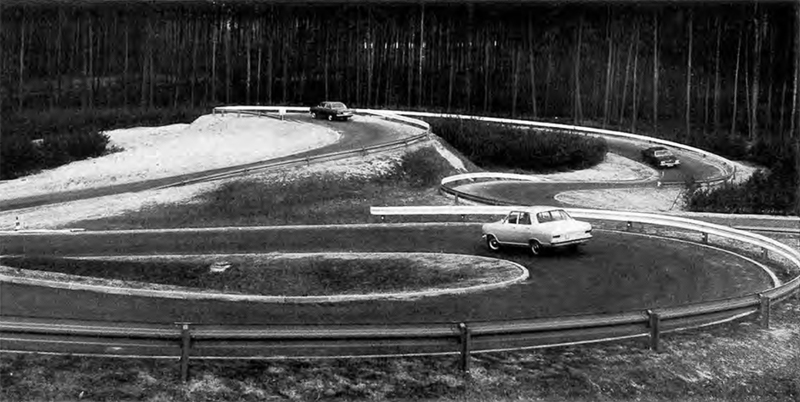 In 1963, Opel began planning a new proving ground and looking for an appropriate site. Over the 50 years that followed, this anecdote would be told time and again: Opel had initially investigated a site in Dudenhofen, Germany near the town of Speyer, but the postal service had incorrectly forwarded the enquiry to the municipal administration of Rodgau-Dudenhofen, which is near Darmstadt. The public officials read the enquiry, which was not meant for them, with great interest. They promptly offered Opel a plot of land within their own municipality. After all, it is a dog eat dog world: When it comes to attracting a business that epitomizes the German economic miracle like no other, every local municipality must put its own interests first. On the morning of April 1, 1966, the forest neighboring the small locality of Dudenhofen fills with noise once again. Despite the screeching of chainsaws and the trundling of diggers that have been commonplace here since November 1964, drivers taking the road through the forest to the next town haven’t noticed much of this happening. After all, the company that has announced it wants to create a ‘future factory’ here has also guaranteed that only 15 percent of the 2.6 million square meter plot it has purchased will be cleared. Yet this morning, the noises are different. It isn’t the construction machinery that has been heard here for the last 15 months. This new noise is richer and more regular. An agreeable roaring sound. From now on, this new sound will be heard more frequently in this part of the forest. Indeed, three days ago, a bus filled with journalists was driven to the ominous ‘future factory’ and the roaring started again shortly after the journalists arrived. Today, however, the sounds are a different kind of different. They are more festive. The passenger car models are revving up, making the kind of sounds you would expect 1960s cars to make. The pure sound of motors, before electronics and other technologies made it possible to custom modify them. The guests who were invited to the opening ceremony of this ‘future factory’ also saw the source of these sounds: the cars themselves. 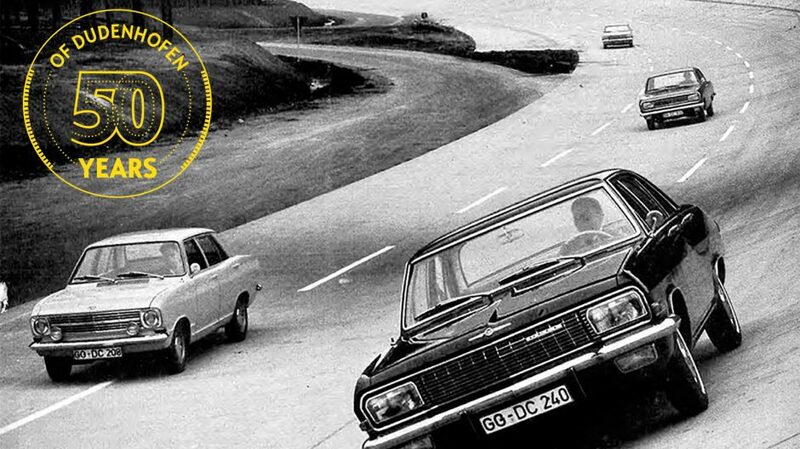 All of Opel’s best-known models were present, including the Kadett, the Rekord, the Admiral, and the Diplomat. Even the sleek Diplomat V8 Coupé was on display. Of course, it is the Grand Tourisme Coupé, the high-performance lab on wheels, that now attracts the most attention. Not far behind it, however, is a white sports car. Many guests don’t recognize this car, which is the smallest model on display. It is stealing the spotlight somewhat, but what on earth is it? Opel hasn’t released a car like that before. It looks bizarre: It doesn’t even have headlights! The ill-informed are enlightened by motoring scene experts, who explain that this car is the Opel GT Experimental. Opel had presented it about half a year ago at the International Motor Show (IAA) in Frankfurt. It is now full to bursting with measurement devices and is acting as a mobile laboratory. And the headlights only emerge when they are needed. This feature is a world first and this design icon will make a huge splash once its market launch has taken place in 1968. 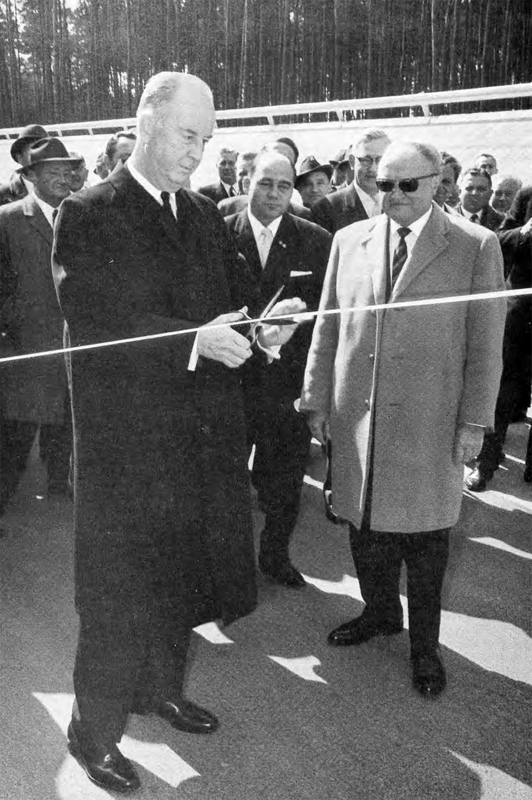 Chairman L. Ralph Mason cuts a white ribbon at the high-speed track to formally open the new Opel proving ground. Beside him is Chief Engineer H. Mersheimer. Although the vehicles speeding past the guests are impressive, so too is the track around which the Opel fleet is being driven. There is a steep-banked curve, which is the kind of thing many of today’s visitors will only ever have seen on the slot car racetracks in their children’s bedrooms. Since 1963, toy racetrack brands such as Carerra have continued to grow in popularity. Yet this track is the real deal. 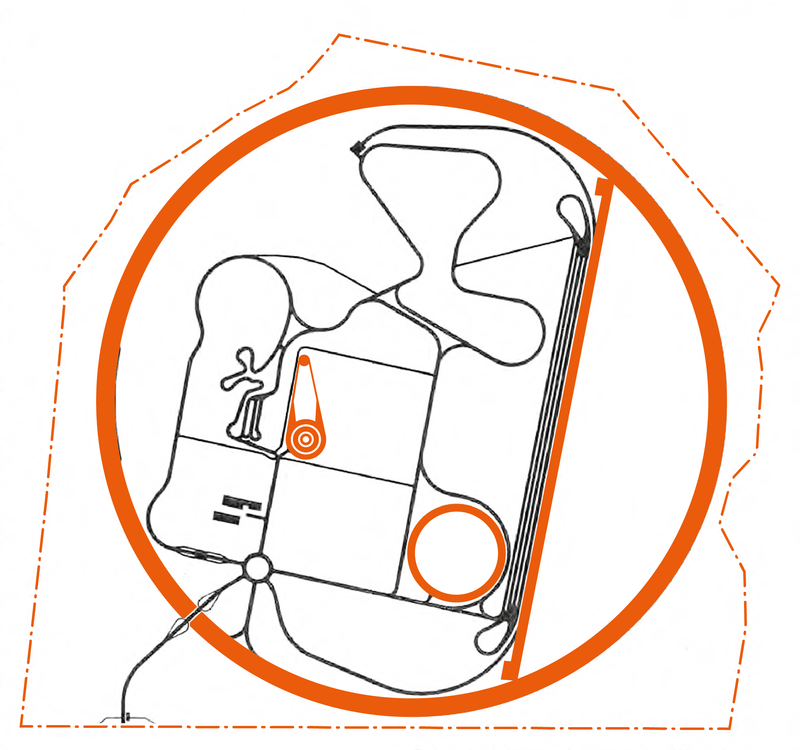 This single course winds through the whole of the future factory’s site, covering a distance of 32.4 kilometers. The guests, who are representatives from the fields of politics and business, take a long time to process and interpret what they experience that morning in the forest neighboring Dudenhofen. Yet there is no need to be embarrassed about this, especially considering that they have never seen anything like this before. Indeed, the Opel proving ground, this future factory, is the only one of its kind in Europe at this point. There are plenty of top-level experts standing by, which is just as well, because the visitors have lots of questions for them to answer once Opel Chairman L. Ralph Mason has cut the obligatory white ribbon to officially open the new facility. The most frequently asked question is, “Why does Opel need this new proving ground?” After all, it was only 15 years ago that the company built a proving ground in close proximity to its Rüsselsheim premises. It was seen as a state-of-the-art facility at the time. “Since then, development has progressed more rapidly than even we could have imagined,” explains Hans Mersheimer, Chief Engineer and Opel board member. In 1951, nobody could have dreamed that the top models in the company’s own fleet would now be driving at speeds of 200 km/h and faster. The proving ground in Rüsselsheim will soon be too small for many tests, such as brake tests at high speeds. 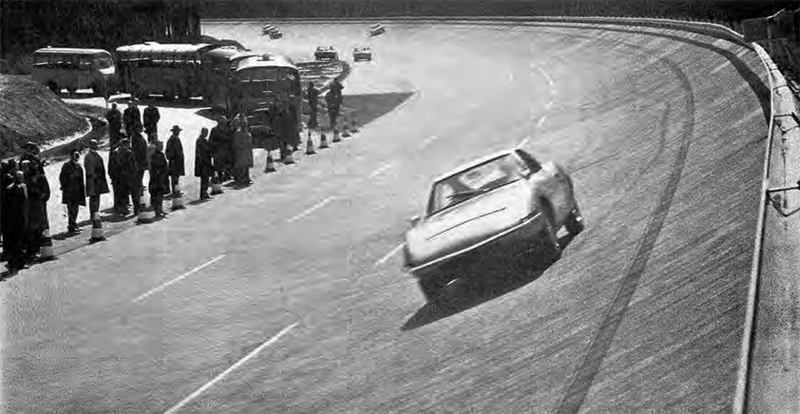 The Opel test drivers had therefore been resorting to using public roads, which were becoming increasingly busy. The increase in traffic is due to the fact that more and more people are buying their own car. As a rule, this is the kind of development that goes down very well with an automobile manufacturer such as Opel. The slight snag is that the company also needs space to rigorously test its cars before it can sell them. In the center of the site in Dudenhofen’s forest is the Perilous Peak. Thomas E. Dolan, Head of the Experimental Groups, explains that the goal is about more than just testing Opel models under every road condition imaginable. Evaluations need to be precise, structured test series. Conditions must remain constant so that repeat tests can be undertaken at any time. This is the only way to obtain exact measurement data that can be compared as usefully as possible. The data and facts that are obtained should confirm the calculations made by the developers when constructing the new Opel model in question. The information should also help to continually improve the current model series. There are endurance tests in which the Opel testers drive a car for 50,000 kilometers over the space of about two months. This process exposes the car to the equivalent of what it would endure over an average distance of 150,000 kilometers on normal roads, which is equivalent to a six-year period in a ‘real’ vehicle’s lifetime. This process involves multiple drivers filling three shifts to drive the car 24/7. This torture track looks practically medieval, with its square, rough-edged, unevenly laid cobbles with large gaps between each stone. This subjects the chassis of any car that drives over this section to a high degree of stress. This road system is new but deliberately bumpy. Yet it needs to be sturdy enough to withstand endless test series without deforming, whatever the weather. How was this achieved? Helmut Stark, deputy head of the main department for factory facilities, can help with this question. In order to achieve a robust road surface that has all of the desired imperfections, the roads have a frost-resistant subgrade with an additional 15 cm layer of cement. 4.5 kilometers of the road system consist of blue basalt and granite cobbles. These stones have been smoothed and rounded from decades of being used on real rural roads. You can’t get much more authentic than that! Only small sections of the track are even and smooth with a standard bitumen surface. The rest of the track has potholes, bumps, troughs, ridges, bulges, and so on. 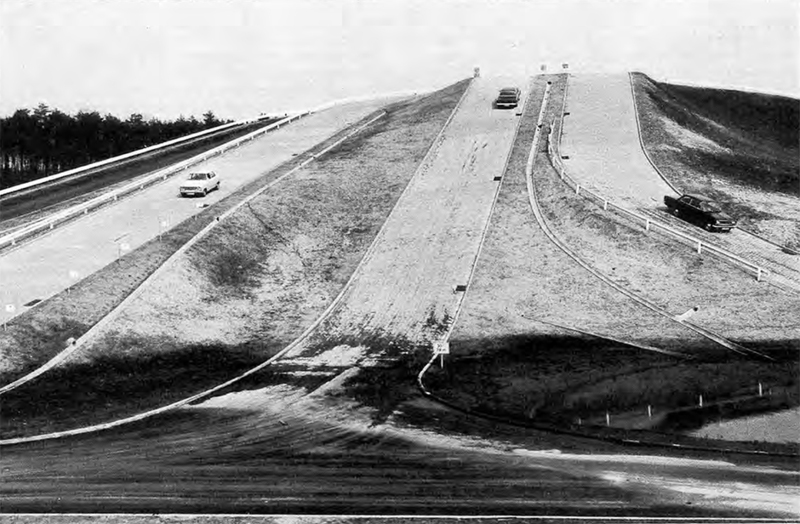 Those who devised these imperfections felt that they were “creating modern art rather than building a road,” writes the Opel Post in April 1966. 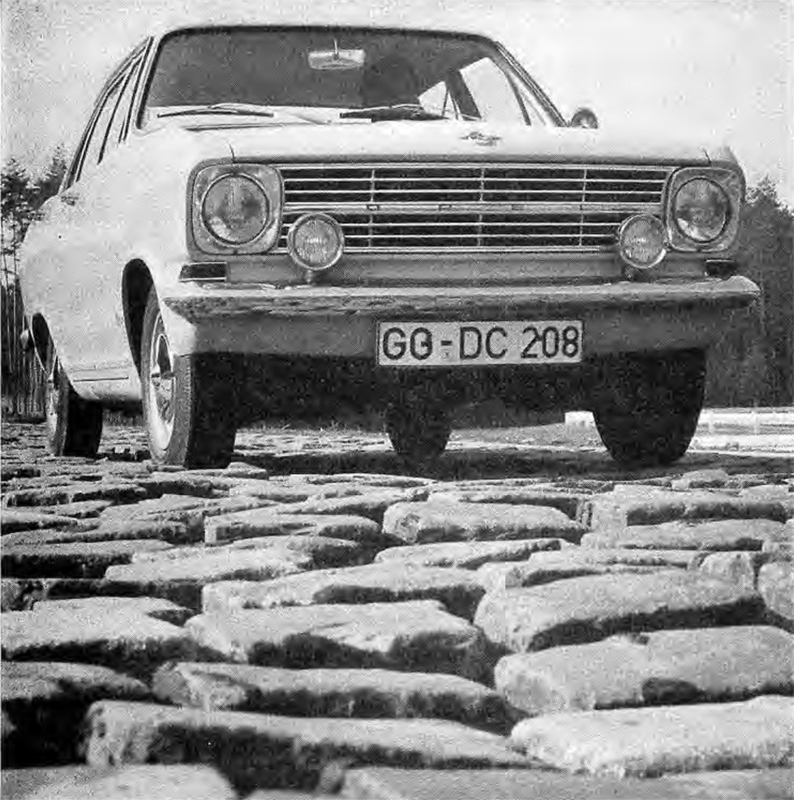 It sounds somewhat paradoxical, but Opel asked the best road builders to create the worst road surfaces imaginable. It took them 14 months to complete this task. This period included exactly 235 days of hard slog, and 91 days where the weather did not cooperate. The forest was significantly quieter on those days. Around ten kilometers of the track system only have a concrete surface. These sections include the ‘torture tracks,’ which feature surfaces made from rough-hewn stone blocks. Another example is the skid pad, a circular disc with a diameter of 100 m. It is used for examining the braking and swerving behavior of Opel cars, and there are constant screeching noises and plumes of smoke whenever it is in use. 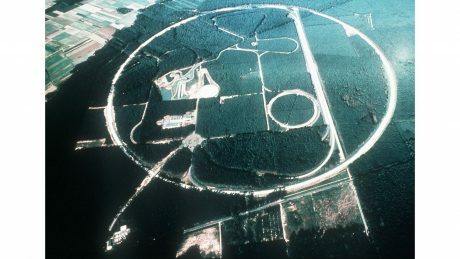 That’s not to forget the high-speed track, which is a large circle that encloses the entire proving ground. For measuring noise during acceleration and deceleration; a skid pad with a diameter of 100 m for testing steering and swerving behavior; torture tracks with a ‘washing board’ surface, humps, and potholes; a skid circle that can recreate wet conditions; sections with sand, dust, and mud; tram rails and level crossings. A variety of surfaces such as large and small cobbles, gravel, and good and poor quality asphalt, as well as sections where vehicles drive through freshwater and saltwater. A curve with a transverse gradient that gradually increases up to 57 percent, for top speeds of up to 225 km/h. This track can be driven as if it were a straight section of road. The trickiest part of the project by far was the design and construction of the circular high-speed track, which has a radius of 800 and a width of 14.2 meters. It needed to be possible for vehicles to drive at high speeds on the track without centrifugal forces pushing them outwards. This would enable the track to provide the kind of data that would be obtained from a straight track. At 225 km/h, this sounds like an impossible feat, but the physicists in charge of the project knew what needed to be done. They needed a road with a transverse gradient of up to 57 percent. In addition to being tested at full throttle, an Opel car should be tested at other speeds. That’s why the design included three lanes. The lowest lane is intended for speeds of up to 80 km/h and the middle one is for speeds of up to 130 km/h. The top lane is the only one that allows you to really put the pedal to the metal without experiencing any centrifugal effects. Accordingly, the transverse curve gradually gets steeper, starting with just two percent at the bottom and increasing to 57 percent in the top lane. Above the top lane there is also a safety lane with a gradient of 75 percent. A custom road construction machine, a slipform paver, was developed so that the concreting of the entire curve could be completed in one single process. For this five kilometer track alone, the concreting process took 30 working days. After all of these displays, many of the guests who are enthusiastic motorists are itching to take a spin on the high-speed track. Or at least to try out one of the special test tracks for themselves. But they hope in vain. Visitors who want to find out more have the opportunity to attend a presentation given by the measurements team. It takes place in the ‘Technology Center,’ where there are 23 hydraulic lifts for undertaking maintenance and repairs, as well as measuring stations, a fuel pump, and a car wash facility. There was never any intention for guests at the grand opening to be offered test drives. The head of the new proving ground, H. R. Riedrich, and his team, which now consists of 100 employees, want to get to work. They want to start creating the future in Dudenhofen.